Heat oven to 350°F (325°F for dark or nonstick pans). Spray 2 (9-inch) round cake pans with cooking spray. In large bowl, beat all cake ingredients with electric mixer on medium speed 5 minutes, scraping bowl occasionally, until well blended. Pour batter into pans. Bake 35 to 45 minutes or until toothpick inserted in center comes out clean. Cool 10 minutes; remove cakes from pans to cooling racks. Cool completely. In large bowl, beat butter and cream cheese with electric mixer on medium speed until light and fluffy. Reduce speed to low. Add powdered sugar, 1 cup at a time, beating until blended. Add 1/4 cup liqueur and 1 teaspoon vanilla; beat until frosting is smooth and spreadable. Place chopped chocolate in small bowl. In small saucepan, heat whipping cream over medium heat until bubbles form around edge. Pour warm cream over chocolate; let stand 1 minute. Stir with whisk until chocolate is melted. Add corn syrup and 2 teaspoons vanilla. Stir until smooth. Let stand 10 minutes or until thickened. Pour glaze on top of cake, letting some glaze drip down side. Sprinkle almonds around edge of cake. Store in refrigerator. To make the cake layers a day ahead of time, bake and cool as directed, then place a slice of bread on each layer. Let stand at room temperature, and your cakes will stay fresh. 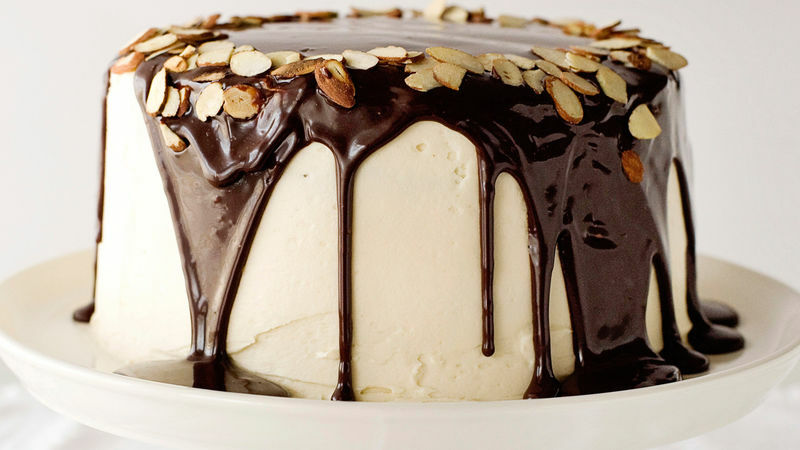 Change out the Irish cream liqueur for another flavor to make an entirely different kind of cake. Amaretto, hazelnut liqueur or caramel-flavored Irish cream liqueur would be delicious in this recipe.